This has been fairly successful before so I’ll try it again. This is an open thread for you to fill with your reports on turnouts, behaviour of party hacks, issues at polling stations, police presence and general atmosphere. It was all calm at my polling station this morning with one cold and lonely looking tower hamlets first candidate standing outside. I watched too many people walk straight past though…….why would people do that???? Come on……VOTE! on May 23, 2014 at 11:18 am You couldn't make it up! I think WHS misunderstands the way polling stations operate! The Mile End Polling Station just happens to be opposite theMile End Underground station that lots of people walk to from all over the north of the borough. Oddly enough it doesn’t cover all the wards those people will have walked from! It’s entirely normal that people will walk past it and not vote!! People have to use the correct polling station for their address in their ward – or use a postal vote – which is of course another reason why people will have walked past polling stations today! A lot of people seem unbothered (walking by, looking away). I really think selling Labour as the only alternative will backfire on us, because so many people I know hate Labour just as much as Lutfur Rahman. At least get these people to come in and vote for UKIP. 20 voters in the first hour at Clare House in Bow East. Quiet so far, much to the dismay of the TV camera outside who are probably hoping for a bust up. Very quiet at the Polling Station at John Orwell in Wapping. But sure that will change during the day. Good thing is a very high level of the awareness of the elections. Would be useful to know how I can subscribe to a whole thread (topic) without first having to publish a response. on May 22, 2014 at 10:54 am You couldn't make it up! The unemployed will vote when they drag themselves out of bed first thing in the afternoon… So it will get a little busier at lunch time. Most people who have a job (almost all of whom will not be backing Lutfur) will vote when they get home from work. Very quiet in Canary Wharf. There was some minor agro between THF and Labour at Tiller Road, and police intervened, but I did not witness it. Police now at every polling station in my ward. Steady flow of people when voting at Mowlem in St Peter’s ward this morning. Only observation was TH First people were only interested in talking to Bengali voters. on May 22, 2014 at 10:44 am You couldn't make it up! It generates a nice map showing where your home is and where the polling station is! on May 22, 2014 at 10:52 am You couldn't make it up! I voted in Bethnal Green about 9.30 – it was pretty quiet but quite a few people were voting. 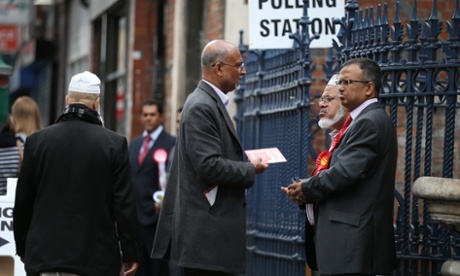 I’m from New Zealand where it’s illegal for parties to campaign on polling day, so it was a bit of a surprise to see a big group of Tower Hamlets First supporters handing out leaflets (facsimile voting papers with a tick next to Lutfur Rahman’s name) outside the polling station. A couple of gents were also circulating inside the polling booth with big THF party badges on. I had to check the UK Electoral Commission website when I got home to check it was legit which it is, no-one was behaving in an aggressive or intimidating manner. There were one or two Labour party people outside as well. I think it’d make elections fairer if this wasn’t allowed. on May 22, 2014 at 12:20 pm You couldn't make it up! Parties are allowed to leaflet people outside – so long as they don’t impede access to the polling station and so long as numbers are not too big. It’s also entirely normal for accredited party representatives to monitor the practices inside polling stations. If people report that groups are getting too loud/large or intimidating I have no doubt that in this election they will be ordered to disperse. However people have to pipe up and report problems. Thanks for the reply. Yes the party reps inside the polling station may have been monitoring, it just seemed odd as there were only THF reps there. on May 22, 2014 at 12:58 pm You couldn't make it up! Well think about it for a minute. Every ward has maybe five or six polling stations. Even the candidate cannot be at all the polling stations at the same time. The number of people who are accredited and allowed into polling stations is strictly limited which means you’re not going to get them inside every polling station in every ward. Most typically think their efforts are btter employed outside where they can actually talk to potential voters – inside they are not allowed to talk to voters. Nobody is allowed to wear party insignia inside the polling station. on May 22, 2014 at 10:59 am You couldn't make it up! Bluecoat School Shadwell…..Just voted, ran the gauntlet of THF and Labour activists, they are stopping approaching Asian voters and talking. Fairly busy. Surprising number of Asian women with men. One policeman IN the hall. Busy around 07:30 in Bow West – had to queue to get my ballot papers. Joshua Peck available outside for a chat, standing proud and confident. Jainal Chowdhury also seen monitoring voters from a distance but possibly a bit too shy to interact with anyone. One or two wet leaflets with Anwar Khan’s picture in a small road puddle nearby. No Police seen anywhere, no obvious signs of any Bengali interpreters, no intimidation, no hassle. Mr Chowdhury: unfortunately I can’t say what I know about him. If only I had had a voice recorder when he visited my front door! on May 22, 2014 at 12:48 pm You couldn't make it up! Bow East. Difficult to tell how it’s going as we’re mostly knocking up Labour promises, but Marc Francis says that people who would never have voted for him or Oona in the past are voting for him and John Biggs now. So it seems positive. Getting reports in about THF canvassers aggressively leafleting as voters going in. Some told to move away by the presiding officer. Stepney Green, at all polling stations. Lansbury. Police have given warnings to some. They have a leaflet which resembles the ballot, to show their supporters where to put the cross. on May 22, 2014 at 12:28 pm You couldn't make it up! Wake up to normal political party practice. It’s absolutely routine for parties to have a leaflet to show their voters where to place their crosses. It’s been happening for years and years. They do a different leaflet for every ward – I was offered three when I went to vote this morning. I always taken them, never read them and bin them when I get home. Does this mean the UKIP party forgot to get some nice polling station leaflets printed? on May 22, 2014 at 12:41 pm You couldn't make it up! To clarify – I was offered polling station leaflets helping me to know where to place my precious X by supporters of the Labour Party, the Conservative Party and Tower Hamlets First party. and the ward candidates get the other side. It’s actually very well designed and some shows evidence of some considerable thought having gone into it. If they have been as serious in their efforts to get the vote out it should get very interesting. …had the numbers, names and candidate statements plus mobile numbers and email addresses. Missed opportunity due to only printing one side. …their leaflet is entirely focused on the Mayor! No mention of the local ward candidates. No statement from the local ward candidates and no contact details. One side has the Mayor and his record of “achievement” (yet again claiming things he is not responsible for!). On the reverse there is a facsimile ballot paper – this was presumably chosen because it’s very clear that THF are recommending no votes for any other candidate for Mayor. Bottom line they KNOW it’s going to go to the second vote! UKIP don’t need to worry. All sorts of things get put into ballot boxes but oddly enough those doing the count are able to distinguish proper votes from facsimile ballot papers! on May 22, 2014 at 12:14 pm You couldn't make it up! What’s aggressive leafleting? What were they actually doing? All the parties are anxious for people to take their leaflets – and not everybody wants to take them. No change there from normal. If the presiding officer and the police are warning them then it has obviously overstepped the mark. on May 22, 2014 at 12:43 pm You couldn't make it up! I’d have thought it’s much more likely the Presiding Officer and Police are reminding them about the numbers of supporters who can be present outside a polling station. It’s not necessarily anything to do with the leafleting per se. on May 22, 2014 at 12:12 pm You couldn't make it up! I voted at 11am ‘somewhere in the borough’ and it was a very pleasant change to see no more than two people for each party outside. All were extremely polite and civilised. It was also interesting to note a lot more people voting than usual and ‘the white vote’ (for want of a better description) has mobilised and is walking to a polling station near me. They too were commenting on a bigger turnout than normal. The reality is that this election will hinge on the turnout. I hope they are, but the area around Olga primary school isn’t exactly Lutfur heartland. on May 22, 2014 at 1:00 pm You couldn't make it up! Well it did occur to me that maybe ELA had a bit of an agenda running. Remember they are an interested party when it comes to advertising placed by the Council – and the antics of East End Life. I reckon too close to call. It will go to second round and Biggs may snap it up then. John Scurr school is heaving with canvassers. There is a allegation in a comment to Andrew Gilligan’s article in the Telegraph that there has been some cunning origami of voting papers issued for the EU election that covers up the UKIP box at the bottom of the paper. on May 22, 2014 at 12:24 pm You couldn't make it up! Am I right in thinking that of Rahman does not get elected Mayor he doesn’t even get to sit as a Councillor? Does that mean that the days of the chauffeur driven Mercedes and the tax funded iPhone will be over and he will have to go back to being……….? Was quiet about 8am at the Polling Stations for St Dunstan’s. Now there are groups of Asian men outside and opposite. They seem to be mostly labour as they have labour flags and banners. Busier than expected in Bow West this morning. Had to queue for about 5 mins to get the ballot papers. Police officer was already inside. Plenty activists outside waving leaflets from all the main parties, more than I’ve seen at any previous election. Slighly annoying since they were blocking the pavement at school run time, but shouldn’t be a problem rest of the day. on May 22, 2014 at 1:06 pm You couldn't make it up! It’s entirely possible that there will be a change in tactics re public order after the police have their shift changeover. For example, more police visible outside rather than inside; more active dispersal of large groups of people – who are NOT allowed to intimidate voters. Interesting, it seems that there is another Tim on here. Hello Tim, I haven’t seen you around these parts before. In terms of the topic in hand, this may be (very distantly) relevant. I voted at Cayley Primary School in St Dunstans at about 9am this morning. About a dozen people at the gates – some THF, some Labour. One person said hello but most of them didn’t say anything. The PCSO on duty was sat inside when we arrived but had moved outside when we left, I think at the request of the Presiding Officer who seemed a little concerned at the numbers outside the gates. There was a trickle of voters but we didn’t have to queue for ballot papers. My partner witnessed a woman being escorted to the booth by another member of the public and said no one stepped in to question it and stop it, even though there were plenty of official people behind desks no doing nothing….. This was in Lansbury Ward….I asked him if he had complained and he said no as he wasn’t aware whether it was allowed or not. So I went in and complained. I also asked the police to watch for that….AND the police was not aware that voters could not and should not be escorted to voting booths….!!!! The Official was not amused as it must have happened when she stepped away for a moment…. on May 22, 2014 at 1:39 pm You couldn't make it up! It’s not the job of the police to manage the conduct of the election. They are merely there to avoid public disorder. The person who is responsible for the conduct of the Election is the Presiding Officer for that Polling Station. He or she is entirely responsible for the management of the election and the conduct of those inside the Polling Station and can ask people to leave if they are not entitled to be there e.g. do not have a vote and/or are causing a problem with the privacy of the ballot. on May 22, 2014 at 1:12 pm You couldn't make it up! 9.1 Candidates should not allocate more than two campaigners to gather outside polling places at any one time. The Police will not allow large groups of a candidate’s supporters to gather in the public space or street outside of the polling place. 9.2 Campaigners should keep access to polling places clear and the pavements around polling places clear to allow voters to enter. 9.3 Campaigners should be careful to ensure that their approach is proportionate and should recognise that groups of supporters may be perceived as intimidating by voters. The Police will be particularly alert to actions that may lead to electors feeling intimidated or influenced. Influencing includes deterring an elector from voting at all as well as influencing them to vote or not to vote for a particular candidate or party. 9.4 The RO will also engage Tower Hamlets Enforcement Officers with delegated powers to move on campaigners who restrict access to polling places. This will reduce allegations of intimidation and ensure electors have clear access to the polling place. on May 22, 2014 at 1:13 pm You couldn't make it up! on May 22, 2014 at 1:17 pm You couldn't make it up! Flipping html code! Try again! on May 22, 2014 at 1:44 pm You couldn't make it up! It’s NOT illegal. It happens in every election across this borough and the UK. All that is required is that those outside polling stations do not impede access to the polling station and conduct themselves properly. They can distribute leaflets – but you don’t have to take them. They’re no different from leaflet distributors anywhere in that respect. It doesn’t happen across the UK. Across the UK voters don’t need a mock up ballot paper shoved under their noses outside a polling station to work out how to vote the way they desire to. In other boroughs I’ve lived in people stand outside the polling station, one per party only, and hold little pads and simply ask voters for their polling card numbers in order to work out who’s voted yet. It bloody well ought to be illegal. If you can’t work out how to cast your vote without taking a slip of paper into the polling station with you you probably aren’t fit to be given the franchise. on May 22, 2014 at 2:11 pm You couldn't make it up! Why not see if you can find the Act? This bill is the same as the act: it is named at the bottom of the bill. But I also believe it was an offence long before 2007.
on May 22, 2014 at 3:37 pm You couldn't make it up! I think you maybe misunderstand. A Bill has all the wording of an Act however it does NOT have the status of an Act unless it was passed into law by Parliament. I can’t see anything which suggests this became law. OK. It turns out this was a private member’s bill that didn’t make it past the first reading. Sorry. This practice has changed, though, possibly by custom. I remember being told as a child by my political activist grandparents that there was no campaigning within a certain radius of the station. All they were allowed to do was ask politely which way people intended to vote/had voted outside the station while looking at their polling card, in order to figure out which doors their party had to knock on in order to get out the vote later. Until today I’ve never seen more than one person from a party at a time outside a polling station. For good reason: it was intimidating. on May 22, 2014 at 4:59 pm You couldn't make it up! No – the practice hasn’t changed as such – EXCEPT in Tower Hamlets where the system for this elections is supposed to be restricting the large groups which have gathered outside polling stations in previous elections. They simply are NOT allowed to do this, nor are they allowed to shout at or otherwise intimidate voters. If they do they should be moved on by the Police. What you recall is exactly the experience I had this morning. * in some wards supporters of THF are gathering in large groups, are behaving badly and appear to be attempting to intimidate voters. This seems to be more towards the west of the borough. AND report it to the Presiding Officer inside the Polling Station who has the power to ask the Police Officer to go and make sure people abide by the law. The Electoral Commission has the final word on this apparently and it takes a rather laissez faire approach, saying: “Campaigning outside polling places. 3.1 Campaigners should be allowed to put their messages to voters on polling day, including in public spaces outside polling places. I wonder why the private members’ bill didn’t get through? Protocol, so I have been told, is 2 party activists allowed per candidate per station. There have been reports of more than that is some places. on May 22, 2014 at 3:32 pm You couldn't make it up! About 6 Tower Hamlets guys, one of them telling directly in which candidates I should vote on. That is illegal in Portugal, is it legal here? Also, maybe I’m paranoid, but I though it was weird using a pencil to vote instead of a pen. on May 22, 2014 at 3:31 pm You couldn't make it up! That’s just plain intimidation. Have you reported it to the Council? This morning apart from John Orwell (Wapping) I have also been to Blue Gate Fields and Ogilvie Community Hall (both Shadwell) and it was very quiet. Eight police officers at Ogilvie and numerous canvassers from various parties outside Blue Gate but police inspector on gate keeping an eye on things. Most interesting part of my tour was the cat at Ogilvie (see tweet). on May 22, 2014 at 3:39 pm You couldn't make it up! on May 23, 2014 at 10:34 am You couldn't make it up! Which idiot voted down the official guidance of the electoral commission? If this isn’t an indication of the total disregard for proper electoral process demonstrated by some people have in Tower Hamlets I don’t know what is! on May 22, 2014 at 3:42 pm You couldn't make it up! Maybe the writer doesn’t understand the Mayoral system? Or maybe he knows something we don’t? Ok, just had a drink with the team, heading back to one of my polling stations. Portakabin, with diesel generator, been breathing in fumes all day. Canary Wharf is civilised so far, everyone pleasant, unlike other wards where we have had verbal abuse against our candidates from THF, and large groups of THF gathering. Respectable number of people at John Scurr around 3.30. More Lutfurites outside (they never approached me) but quite a few Labour too. Everyone duplicating everyone else. My daughter, who lives on the Isle of Dogs, had a Lutfurite knock on her door whilst she was still in her pyjamas so full marks for diligence to that man. Harbinger, at about 4, looked quite quiet, though. Just voted at Stebon Primary School, Burdett Estate, Lutherites en mass outside and one man inside the school grounds corralling women to vote for Luther. I am livid as every single voting both had a vote Rahman leaflet in it. Surely that cannot be allowed? on May 22, 2014 at 6:49 pm You couldn't make it up! That’s disgraceful! The Presiding Officer should be sacked. People do leave leaflets behind them but one of the jobs of the people staffing the polling station is to make sure they are regularly removed – so somebody has NOT been doing their job properly. Sounds very organised to me. One also wonders what the police were up to. Thanks to all for the feed back and thanks to Ted for organising this forum. This is the first time my partner and I have voted in Limehouse, previously it was Chisenhale School. The two experiences were almost poles apart, I am not a shrinking violet by any standards however, even I felt an air of intimidation when going to vote at Stebon School and the fact my partner nearly stopped all blood supply to my hand by squeezing it so tight showed a similar response. The returning officer seemed to have an air of resignation about her, while I noticed that nearly every voting both had a THF leaflet it was my partner who pointed out that a waste paper bin was overflowing with with the same. It would be fair to assume that the returning officer or other members of staff had been removing these leaflets throughout the day. While I stood in the small playground still within the school grounds, waiting for my partner there was a young male blocking the entrance of three young Asian women, he had a THF leaflet and was telling them which counsellors they should vote for and of course Mayor. The women did look somewhat nervous however the man actually asked where they were living and brought them inside to register. I did report the matter to the Police and they informed me that there had several complaints of such activity across the Borough. Perhaps my feelings were influenced by the contempt I hold for the divisive politics of the incumbent Mayor. I do accept that there are significant cultural differences when it comes to the political process in this Borough however, I did leave the polling station feeling a mixture of anger and sadness. Am I living in the past and looking at the world through rose tinted glasses? on May 23, 2014 at 11:33 am You couldn't make it up! We will be making progress in this borough when women who are asked to reveal their addresses in the street feel able to tell the person who asks – outside a polling station – that it is none of his business. The ONLY people who are entitled to ask for your address is the Polling Clerk who needs to mark up on their record as having been issued with a vote. Everybody else is just being being plain intrusive and, if they block access to the Polling Station, are also acting in an intimidating way. I think the Borough Commander is going to need to explain what were the Police doing at Stebon School (or not doing) and why campaigners were not managed better. Call the police. 101 or 999. Malmesbury Road primary school (Bow West) around 3pm: surprisingly large turnout for mid-afternoon – a steady stream of voters. Thunder and lightning and a massive rainstorm started just before I got there (suitably appropriate weather maybe) so it was an opportunity to hang around for quite a while after voting to wait until the rain finished. 95% Bangladeshi turnout at the time. I guess that the non-Bangladeshi voters will have jobs outside the borough (or in Canary Wharf) and will have been at work at the time and vote early morning or later in the day on their way home. Tower Hamlets First had a car parked not far from the polling station displaying their posters, with a guy standing by the car. Another TH First man was having a short break inside the hall just by the room which is used as a polling station and I later saw him handing out leaflets outside the school. No sign of Labour but they may have been knocking up the local area and getting the vote out. One of the independents (Andy Erlam) had a leafletter handing out information to commuters as they exited Bow Road station. A police sergeant who I know, who is based in West End Central (Jermyn St Westminster) has told me that at this morning’s briefing there was specific mention that Tower Hamlets borough command was in need of extra support today. I saw vans of police driving slowly round the Coborn Road area near Malmesbury polling station. Oh, and reps for Anwar Khan (or maybe it was the candidate himself) were handing out leaflets in the hall just outside the room used as the polling station. on May 22, 2014 at 6:51 pm You couldn't make it up! Christ Church School (SPB1) was steady. Cllr Abbas pressing the flesh nearby with some grumpy-looking THF men nearby. Unlike last time the ballot boxes were all sealed. According to the returning officer only five or six burkhees had voted and they were subjected to additional checks to avoid personation. Canon Barnet School (SPB2) quite busy. Crowd of about eight THF goons on Commercial Street and three more at the back exit plus two Labour. One Labour flyer in station and one yellow ballot paper left on one of the booths. The presiding officer had made an ad hoc note of seal numbers on the back of an envelope. I don’t get why they were asked to seal but not told to keep a proper record of the seal numbers. Underwood Street (SPB3) had about 30 THF supporters outside with (Gullam Robanni) although most people coming in were clutching Labour flyers. Lutfur Rahman himself turned up to vote at about 8pm with a cameraman in tow who was then told by one of the presiding officers not to come in. It seems some people (the cameraman, but surely not Lutfur?) don’t understand the principles of a secret ballot. Again the issue with sealed ballot boxes was again apparent. Boxes were sealed and the seals had numbers but no record of those numbers were kept… and there were other seals in bags in the premises… so basically someone could remove the original seal, stuff the box, and then put on a new seal of the same colour and nobody would be any the wiser. It’s been a dead day. Which imply’s a Lutfur Victory?? I can’t imagine even a 35% turn out. That’s interesting. Hey if he loses, it won’t be the end of him, surely? I got the impression they sounded quite anxious… but they did say the white vote was much higher. I think all the attention given to UKIP and the vast scare campaign the establishment and the press has embarked on has spurred “the lazy left” into action and these people who are voting to stop UKIP winning the European Elections are then, while they’re there, voting for Labour in the local elections. That is such a hopeless analysis!! Even if turnout was 15% higher, it does not mean that they all voted for Biggs. They voted for UKIP, Con, LibDem, Greens and THF etc. Why would Tories vote for Lab when there’s a Tory candidate? Why would LibDem, UKIP, Greens vote for Biggs when they have their own candidates? These candidates did not stand for mayor so that their own supporters can vote for Biggs. That is cloud cuckoo land analysis. There is evidence to suggest that Labour voters were voting for Lutfur not to mention Lutfur’s own supporters. Lutfur should win in first round. We should find out by this time tomorrow. on May 22, 2014 at 11:21 pm You couldn't make it up! So long as more than 50% of the electors who voted actually chose somebody other than Rahman, then Rahman does not make it on the first vote – at which point the second votes come into play. There’s a lot of people who don’t like living in a place which keeps hitting the headlines for all the wrong reasons. Hence whatever people’s personal political inclinations for voting for their first vote, I’m pretty sure a lot of them will have given John Biggs their second vote. That’s when the count really gets interesting……. At the polling station opposite Mile End Station it was busy at 8PM. Well behaved canvassers outside, although the THF guy did get a bit too close to me and the door on the way in. Having the copper on the door ensured none of the canvassers went inside. Daughter at booth opposite mine heard to say “Is this for prime minister?” to her mum, who replied “Don’t! You’re embarrassing me”. The daughter was 6ft and looked about 17. Says it all. Apathy First. A disabled guy (looked like he’d had a stroke) was made by the presiding officer to come back and put a better mark on his ballot papers. He was refused a rubber! Not sure how presiding officer knew about the “weak” mark? Glad there weren’t crowds of THF outside – I think that is quite intimidating. Shadwell, Blue Gate School was horrendous all day. Huge swathes of Bangladeshis intimidating voters, and the Police doing bugger all. All from Loony Lutfer and Labour. I tore up their flyers in their faces, but I’m 6’2″, and I’d like to see them try it on with me. They forced people onto King David Lane, which feeds from the Highway, and created a clear health and safety risk. Many affected were very elderly. These people should hang their heads in shame, as should the police who failed to act effectively. I almost wished someone had mowed them down with their car, it was that bad. This was from 08:30 till the voting ended. These people are animals with little sense of decency and consideration. on May 22, 2014 at 11:24 pm You couldn't make it up! There is no way elections in this Borough will ever change until people stand up and report all the things they saw which were not as they should be. I can only second this comment, although fear that it is now too late to do anything about it, given that the voting has finished. on May 22, 2014 at 11:32 pm You couldn't make it up! Yes – but there are elections again in the future. It’s time for us all to stand up and say very clearly that the conduct of elections in this borough is way below the standard we are entitled to expect. I was very pleased when The Returning Officer announced there was going to be a tough new protocol. The trouble is they seem to have focus all the rigour on the postal votes (which I am grateful for) and forgotten to retain their Presiding Officers, polling officers and police at polling stations. on May 22, 2014 at 11:33 pm You couldn't make it up! ” forgotten to retrain their Presiding Officers, polling officers and police at polling stations. The police WERE prepared to disperse crowds which under the RPA are not allowed to impede access or potentially intimidate voters. They have powers to ask people to leave and were happy to do so but they needed people to ask them to do it. Either voters could contact them (e.g. ask the officer on duty yourself) OR the presiding officers could ask the police to do something. Sitting there and waiting for somebody else to do something is never a good tactic in my book. I complained to the presiding officer in the morning, and the Special Constable in the evening, they both did bugger all. The cynic in me could ask if this was due to them all sharing the same ethnicity…. I thought we’d seen the back of this kind of thing. It was like the EDL with sun tans. Had the situation been reversed there would’ve been accusations of racism, fascism etc. The government need to step up and stop this kind of thing in areas such as LBTH, especially following the recent Pickles lead investigations and previous form of these people. Let’s pray that the right result is achieved, and we get rid of these shysters for good. In fact, let’s hope they rot in jail. Though if rumours are true, I hear a few of the cabinet members may like the company ;)……. I’d naturally be opposed to anything ‘intimidating’ but I wonder how the word is being used here. I’m going to guess it might be things like people telling you loudly you should vote for X, or thrusting leaflets in your hand. I really do not see that as intimidation – personally, I quite like a bit of streetlife and welcome such, but I can see others may not but I really think someone would have to be incredibly mousey to see such and think ‘oh dear, I can’t vote’. I can#t see anyone at all thinking ‘oh no, i’m scared. I won;t vote Y now, I will vote X as they are telling me to’. Intimidation to me would be stuff like – we know you’re opposition, so clear off’ or say demanding to look into the voting booths. I think the word is too overused. I know it’s TH and people think it has a reputation to live up and so like to tell tales to keep in that spirit to but the ‘stories’ here are near junk (‘why do they use pencils – is it a conspiracy!’) save the one about leaflets in voting booths (and would council stuff really be so lax to allow that?). Move along – nothing to see. on May 23, 2014 at 5:09 am You couldn't make it up! I agree with you. The reality though is that people should be allowed to go and vote without having their access blocked and without feeling unduly intimidated. It’s all down to numbers at the end of the day. All the people I met this morning spoke to me politely. No more than two men per party. All offered leaflets rather than thrusting them into my hand. Most spoke to me on the way out as well. But they ALL behaved in a civilised way and were pleasant. I forgot to mention earlier that every single one of them was a Bengali man. I think actually a lot of the comments this time are from people who have never voted before – or who haven’t voted in a long time. If they had they would know that a lot of the things they are commenting on is just the way things are around here and have been for some time. Which is interesting in itself! on May 23, 2014 at 11:14 am You couldn't make it up! I think you’ll find the question about the pencil came from somebody who is Portuguese – who was saying it would not be allowed in their country. Rather than criticising it why not sit and think for a moment. It is a fair point – why do we allow pencils? No – look at it the other way. We have pencils. What is possibly wrong with pencils? But then if you are getting into the territory of altering ballot papers, they could just be burned, replaced, etc. Which is the mindset of people here – It’s TH! It must be fraud!!! There are men stood outside the polling station! I reckon they are telepathically intimidating all women to vote Rahman! A bloke told me down the pub that some guy he used to work with said all Bengalis have this special livecam taped under their prayer cap to show how they vote and if it’s anything but Lutfur they are beheaded in the mosque!!!!!!!!!!!!!!!!!!!! What about those poor elderly folk forced into the road by rowdy canvassers in their dozens? Is this acceptable? There are rules, stick to them. However, I must admit, these people harassing the electorate don’t realise that it can have a negative effect on floating voters. I’d be a lot less likely to vote for any party which engages in such forceful tactics. Let’s hope it not another 4 years of wrongdoing, wasting public money, community division, hypocrisy and lies. That goes for Lutfur and the lot of THF. They showed their true colours at yesterday’s elections, and I hope the public will speak. Fingers crossed PWC get him and his cronies by the balls, and sling them all inside!!!!! on May 22, 2014 at 11:28 pm You couldn't make it up! The only reason Rahman got in was because he won on the first vote with 51% of the vote. If the turnout is significantly up on 2010 then Rahman is certainly not going to walk this. It’s all going to turn on the second vote. on May 23, 2014 at 5:11 am You couldn't make it up! You can vote this down all you like – it still won’t change facts! The only candidates we saw putting their own seal on the ballot boxes were THF. Make of that what you will. Happiness! Happiness! The greatest gift that I possess! When will the count for LBTH begin? on May 23, 2014 at 10:22 am You couldn't make it up! and what are they counting first – Councillors or Mayor? on May 23, 2014 at 10:46 am You couldn't make it up! They’re predicting a result by 1pm. I’d say that depended on whether or not the number of ballot papers in the boxes corresponded to the number issued in the records maintained by the clerks. If they don’t then they’ll have to do a matching exercise back to the prime record and that will mean it takes a lot longer. I’m no Labour supporter, but I’d rather them than these crooks a bullies. Though, weren’t they to blame for Lutfur and co in the first place? The labour party is hardly to blame for how other people behave. From what I can see everyone I know (bar none) has placed Labour as their second preference, many would rather use a cheese grater on their back side and sit in a bucket of vinegar than vote Labour however, so strong is the feeling that we must get rid of the current Mayor they have taken the non-vinegar option. I have never seen so many people motivated to vote because they want to get rid of someone. I reckon if the Monster Looney Raving Mad Party (where are they now btw) were the only real contenders to compete for Mayor, they would have got peoples’ votes. on May 23, 2014 at 11:10 am You couldn't make it up! Presumably the lesson Labour need to take from all this is that they need to be a lot more rigorous about those who use them as a party of convenience for their own agendas. Whatever you think of their politics, UKIP has at least demonstrated that it is perfectly possible to set up a new party if you have a different perspective on how things should be and work towards gaining acceptance of that perspective – and then attracting the votes at elections. Only if you shortcut the path to power do we seem to get lots of accusations of wrongdoing – or so it seems to me. Interestingly, irrespective of whether or not UKIP do well in Tower Hamlets, their increased vote at the last set of local elections in 2012 and their greater prominence this time around has helped make immigration the #2 Issue on the list of what concerns people nationally. That of itself has galvanised a lot of people to come out and vote. on May 23, 2014 at 10:41 am You couldn't make it up! I wonder how many breaches of this guidance were seen in Tower Hamlets yesterday – and whether there will be any further breaches in the Count this morning. So does this include all those instances where somebody tells someone else that voting for one candidate is the ‘correct’ thing to do religiously and – it would therefore follow – voting for the other candidate would be in some way betraying your faith? Yes. Now go and prove it. on May 23, 2014 at 3:59 pm You couldn't make it up!